One of two men died after a route 41 minibus crashed into a car on Aubrey Barker Road South Ruimveldt. The dead man has been identified as William Trim. The survivor is said to be nursing serious wounds about the body. 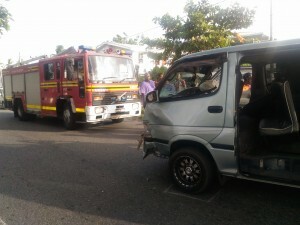 The Guyana Fire Service was summoned to the scene to remove the mangled body of the elderly driver of the car from his vehicle. 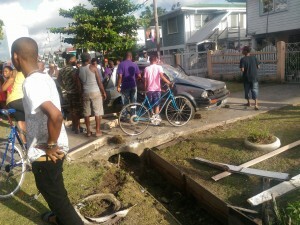 Demerara Waves understands that the minibus was speeding along Aubrey Barker road when it swerved from another vehicle and onto the path of the vehicle. The vehicles are still at the scene and police investigations are continuing.